this post is about to hack someones facebook password with phishing website.Now a days google receiving too much queries like “online facebook hacking, hacking facebook accounts, facebook hacker, facebook password hacker, facebook hacker online”. Today everyone wants hack someone’s facebook account. but hacking into a facebook account is not so easy. it’s a billion dollar company and they are increasing there security day by day. we can hack someone’s facebook account by making fool to victim. There are some basic methods for that. one of from is most popular method i.e. phishing. this post is all about to hack someone’s facebook account from phishing. According to Wikipedia Phishing is attempting to acquire information (and sometimes, indirectly, money) such as usernames, passwords, and credit card details by masquerading as a trustworthy entity in an electronic communication. Communications purporting to be from popular social web sites, auction sites, online payment processors or IT administrators are commonly used to lure the unsuspecting public. Phishing is typically carried out by e-mail spoofing or instant messaging,and it often directs users to enter details at a fake website whose look and feel are almost identical to the legitimate one. Phishing is an example of social engineering techniques used to deceive users, and exploits the poor usability of current web security technologies. to hack someones facebook password with phishing does not need too much things. it only need proper guidance and proper codes. today we create a facebook phishing page to hack someones facebook without them knowing which look similar to a facebook page but it’s not actually a facebook page,when victim enter his username and password you will be able to see that…. go to facebook website and then right click there .now click on save as.a new tab will open .then one file index.html and a folder of facebook scripts will be generated. now open index.html in notepad and paste all the text here. press CTRL+F,and type action. you will have to find a text like action=”https://www.facebook.com/login.php?login_attempt=1″ . save this file in a folder as index.htm or index.html. your phishing page is ready. 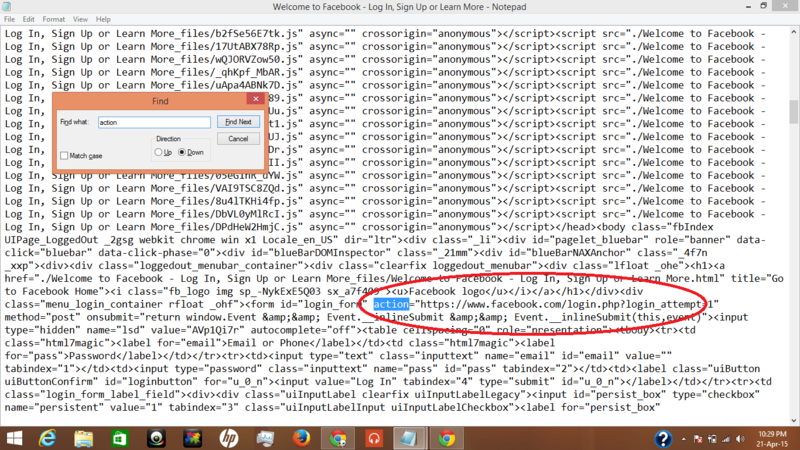 now you have to create a php file which will redirect your phishing page to original facebook website. You have two files now one is index.html and another is post.php, remember file extension is important. Now you have to upload these files in a web hosting site ,i prefer u to use www.000webhost.com. You have to make a account in www.000webhost.com. ,after that it looks like a picture given below. Now go to control pannel,and then click on file manager. After that a new tab will pop up.public _html. index.html ,post.php and folder of facebook scripts. Copy the url (i.e. your domain name) of that page and send this link to your victim,when your victim try to login in to it with the username and password .the page redirectly connect to facebook. and you will be now able to see his password. Open your 000webhost account and go to file manager then public_html,here you find a new file named username.txt. Click on view now u will have your friend’s password and email id. This is a simple trick to hack any Facebook password account by phishing page. you can also upload these files to your apache server to hack facebook passwords on same wifi . for any assistance about apache server go to my previous post . if your phishing site is detected by webhosting providers then you can try this Advance Phishing Method and tabnapping method to hack someones facebook messages/passwords for free. notify me through comments so i will resolve them.if your phishing website is detected by webhosting provider then you can follow this advance phishing method. Editor’s Desk- Phishing is a Crime. 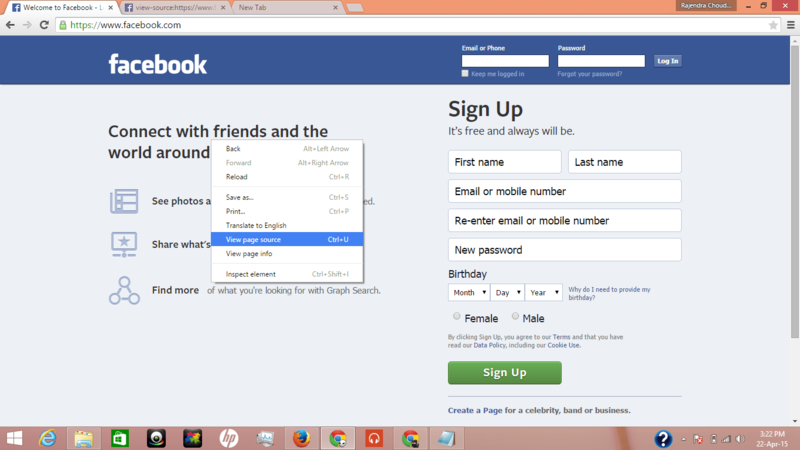 The above tutorial is to instruct people how they can save save their facebook accounts from phishing attacks. Always check URL of website. it worked for me. i just hacked a fb account from this. I just need one email and password. Vic is unknowingly cooperative and follows all my directions ie sending identification. Can I borrow your url and you send me her login info please? nice work.I’m amazed at how fast your blog loaded on my mobile .. I’m not even using WIFI, just 3G .. Anyhow, amazing site! I followed the instructions. However, when I went to the website. The site pulled up but did not look like the regular site. The format of the site was distorted. Can you check the information listed for the post.php file? Does that need updating? i checked post.php file. may be your webhost provider detected the phishing site. try advance phishing or tabnapping method. You said “Copy the url (i.e. your domain name) of that page and send this link to your victim”. What did you mean by “send this link to your victim”. Do I have to send message to his e-mail or where? you can email to victim. 000webhost not working . any suggestion ? try 5gbfee.com it’s also good. 000ernhodt isn’t working. Please recommend a new one!